British Railways Steam Locomotives 1948 – 1968 is a hugely detailed work by Hugh Longworth, covering the subject comprehensively. 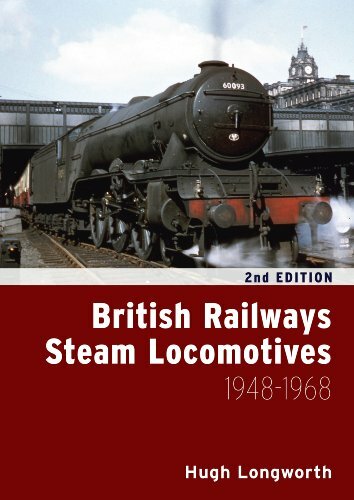 This is a superb book, and although a little pricey, it’s worth it as definitive reference for all steam locos in the BR era. However, if you are looking for a photographic volume, this is not for you, but don’t let that put you off. In years to come, this will indeed become the bible for steam loco enthusiasts who have already acquired numerous photographic volumes, and it will undoubtedly be the best cross-reference book you will ever have! In 1948 the newly-created British Railways inherited more than 20,000 steam locomotives from the ‘Big Four’ companies and from the other smaller railways Nationalised at the same time. Over the next 12 years production of steam locomotives continued, many of which were to pre-Nationalisation designs before the introduction of the new BR Standard classes in 1951. A total of 999 BR standards were built and in addition, more than 750 ex-WD Austerity locomotives were also taken into stock. Despite the vast numbers though, by the end of 1968 all BR owned locomotives had been withdrawn, and the vast majority consigned to the scrap heap. First published in 2005, High Longworth’s monumental work chronicling each steam locomotive operated by British Railways between 1 January 1948 and the end of main line steam in August 1968 has become a standard work of reference. Since the book’s first publication, Hugh Longworth has been updating and correcting the information as new sources emerge which has enabled the publication of a completely revised second edition. The new book includes updated data and illustrations of many of the classes and as a new feature, line drawings of each locomotive class listed in the book. Covering all the locomotives inherited in 1948 as well as those constructed post-Nationalisation, the book enables the reader to identify precisely the history of each individual locomotive. Information provided includes technical data, modifications, date of construction, names, date of withdrawal and much more, thus providing the reader with a single-volume reference to the many thousands of steam locomotives operated between 1948 and the end of main line steam in 1968.